‘While you were watching, a stone was cut out, but not by human hands. 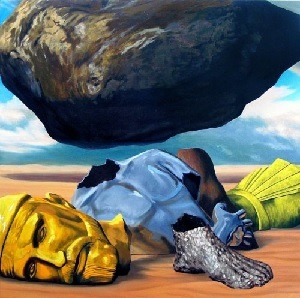 It struck the statue on its feet of iron and clay and smashed them. Then the iron, the clay, the bronze, the silver and the gold were all broken to pieces and became like chaff on a threshing floor in the summer. The wind swept them away without leaving a trace. But the rock that struck the statue became a huge mountain and filled the whole earth’. is easily answered, because Jesus Christ told us directly to whom it refers. This was an Old Testament reference to Psalm 117:22 (Douay, otherwise Psalm 118:22). This was a “stone” (a “rock”) that would shatter the successive pagan kingdoms of Daniel 2 that would encounter it. Jesus continued his statement, still with reference to Daniel 2 (Matthew 21:43): ‘Therefore I tell you that the kingdom of God will be taken away from you and given to a people who will produce its fruit. Anyone who falls on this stone will be broken to pieces; anyone on whom it falls will be crushed’. I Peter 2:7-8 explains this further, with reference, again, to the Old Testament (Isaiah 8:14): “He will be a holy place; for both Israel and Judah he will be a stone that causes people to stumble and a rock that makes them fall. And for the people of Jerusalem he will be a trap and a snare”. I Peter 2:9 goes on to tell exactly who were Jesus’s “a people who will produce its fruit” to whom the kingdom will be given: “But you are a chosen people, a royal priesthood, a holy nation, a people for God’s own possession, to proclaim the virtues of Him who called you out of darkness into His marvelous light”.